YES! 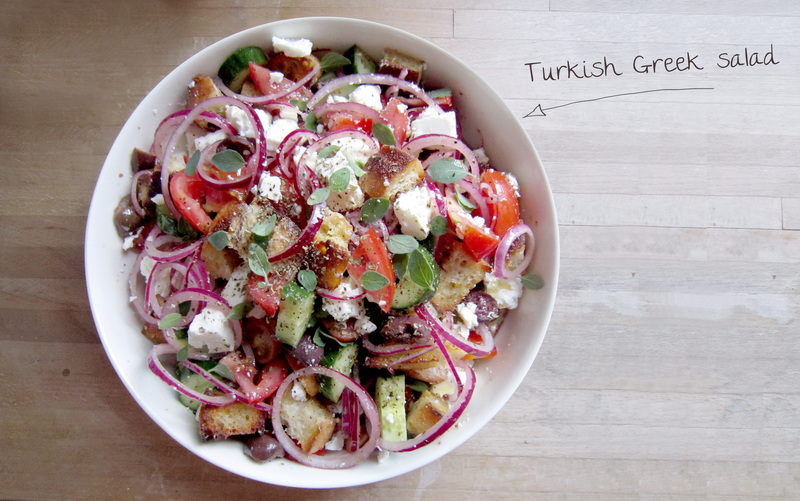 That’s right, a Turkish Greek salad, with beautiful ingredients entirely sourced from the local (and amazing) Turkish supermarket. This recipe really illustrates how I’m feeling about food at the moment – classic, fresh and uncomplicated, with great ingredients that together come to form dishes inspired by places south/east of the mediterranean. The swollen, purple olives (buy them with stones, for the flavour benefits and remove them yourself – well it’s not like you’re doing much cooking with this recipe! ), the tiny foreign-looking cucumbers in odd shapes and sizes, the ripest tomatoes you can get, and – importantly – a fantastic pide loaf. 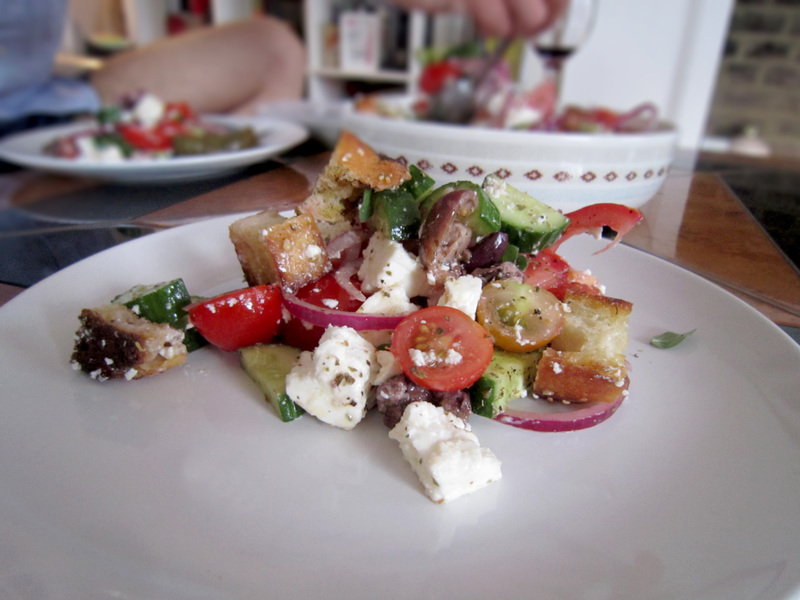 Together, these ingredients simply combine to form what is commonly recognised as a Greek salad, an ensemble that is oh-so familiar and ever-present, despite the fact its fallen waaaay off the food trend track. I’m pretty sure we can blame the likes of Tesco, Pret and other supermarkets/chain lunch cafes/coffee shops for providing rubbish sub-standard versions of this dish, which only needs good quality ingredients to shine. Seriously, how hard can it be to f**k this up!? I’ve shunned the traditional green pepper (you get all the green freshness you could ask for from the cucumbers and all the sweetness you need from the tomatoes) for the much more exciting hunks of fried leftover bread – in this case, a beautiful Turkish pide. I really recommend borrowing an idea from the Italian panzanella or middle Eastern fattoush and adding a little crispy bread to your salad – it adds bulk, a welcome dose of carb and a satisfying crunch. 3 – Move onto your olives; use your hands to remove the pits and break the flesh into 2 or 3 pieces; it’s meant to be rustic! A deliciously fresh salad! I love it. That is all I want right now too. I, too shun the green peppers…especially in a greek salad. I’m glad I’m not the only one! Green peppers only really belong in spicy hot dishes like curry or chilli, where the sourness is welcome – for me, anyway! Let me know how it turns out/if you like it!